As part of the Beyond the Valley Studio Tour Debbie suggested that I do a painted interpretation of one of Angela Sirr’s glass landscapes and that Angela interpret one of my paintings in glass. Angela and I, without giving it much thought, decided it sounded like a great idea. This image is Angela's amazing fused glass landscape that I was to interpret. I am used to painting a scene where my main concern is what detail to leave out. Here I have no detail and have to decide what to add. After a lot of hand wringing, hair pulling , and planning I came up with what may be one of my best paintings ever. I gave this painting to Angela so that she could interpret it in fused glass. Glass is unforgiving and unpredictable so Angela spent hours struggling to come up with a decent landscape. Many bubbles and cracks later she ended up with two pieces that I think are brilliant. I am not posting our finished products here. To see them you will have to come to Angela's Studio during the Beyond the Valley Studio Tour where they will be shown prominently with the originals. We hope to see you there. 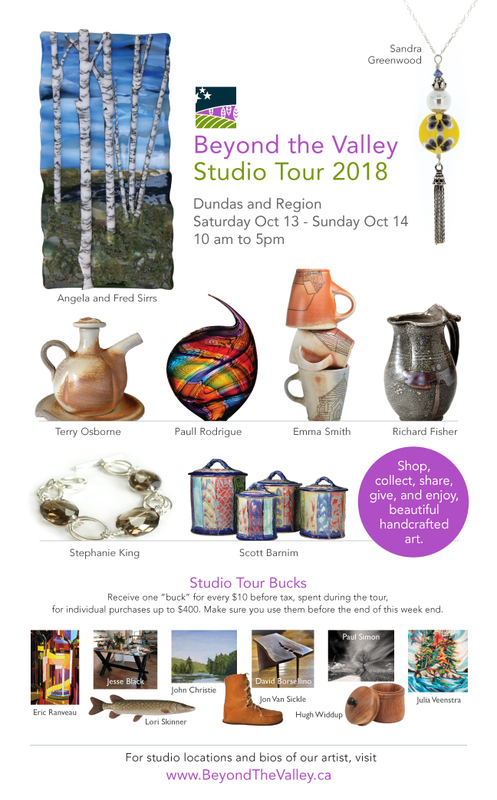 I am honoured to announce that Fred and Angela Sirrs kindly invited me to be a guest artist in their studio for the 2018 Beyond the Valley Studio Tour. They both produce exquisite fused glass jewelry and Angela has started creating amazing landscapes in fused glass. The image of the birches in the upper right of the invite is actually in glass. I will be showing my paintings from this summer on Georgian Bay and Lake Superior and a few from last summer in Newfoundland. I am finally getting comfortable with acrylic paint and I am producing my best ever work so I can't wait to get your feedback. Debbie and I spent Saturday with ten or so artists that we met this summer at Sylvia and Peter's cottage on Lake Erie near Selkirk. I was a day filled with painting, wine, laughter and friendship. I always thought that painting big water would make for a rather boring composition however this summer has me thinking very differently. Lake Superior and Lake Erie have inspired me enough to produce what I think is some of my best work and that is exciting indeed. I produced four painting and am happy with two of them. I was offered a wee dram half way through the second painting and things started to go down hill at that point. The fun and laughter started to increase though so it was all good. This first painting was painted in the morning looking north east from the shore in front of their cottage. I was excited with this one because it is about my third or fourth painting where I managed to get waves that looked like waves but were still painterly. This next painting is actually my third painted with the taste of a good single malt lingering on my taste buds. Thank you Wendy. I was standing in almost the same location as the first painting however I was looking south west. I don't think that I would ever tire of the views from their cozy retreat. I would once again like to thank Sylvia and Peter for being such amazing hosts. We are still giggling every time we think of some of the stories.